Bob and Gerry Bennicoff do it all. For years, the dynamic duo have volunteered at Goose Pond Sanctuary doing whatever needs to be done: seed collecting, counting frogs, cleaning out the barn, and more. 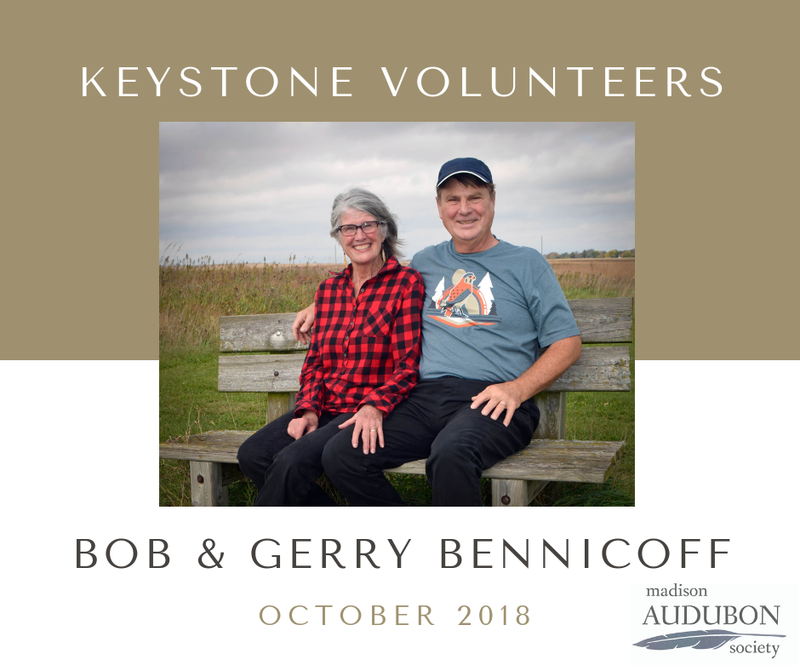 When Bob and Gerry were looking for an organization to volunteer with, we were sure glad they chose Madison Audubon! Bob and Gerry are a major volunteers for the American kestrel nest box program where they monitor nest boxes, assist with erecting/retroffing nesting boxes, and banding adults and young; they help survey for the Columbia County Breeding Bird Atlas and have assisted with whip-poor-will counts and canoe routes — extra difficult and time-consuming activities; they provide assistance when large groups come out to tag monarchs and they also tag monarch on their own; they are key volunteers with our prescribed burn program and with prairie seed collecting and planting. They also help with the annual butterfly count, frog counts, and other projects at Goose Pond Sanctuary. We are tremendously grateful for this power couple and all they do for the natural world and the people who tend it. If you’re interested in volunteering with Madison Audubon, we’d love your help — click here to find out ways you can best connect. This dynamic duo has been responsible for organizing Madison Audubon’s expansive list of public, diverse, and fascinating field trips for years. Each fall, Levi and Peter sit down with a calendar, a grin, and a bag full of ideas for what types of trips we should host the following year, and who we might ask to lead them. Their large network of birding, butterflying, botanically minded cronies are persuaded into service, thanks to Levi and Peter! In addition to planning out the types, locations, and dates of the 20-40 field trips we host each year, Peter and Levi often lead them too! They bring people to nature, and make birding, butterflies, and natural history things to explore openly and thoroughly. 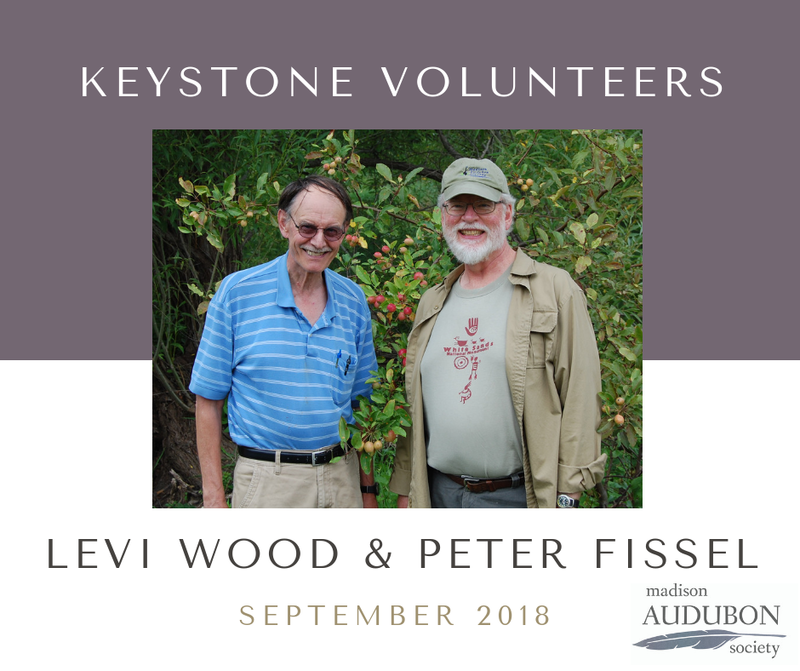 Thank you to both Levi and Peter for the many hours you dedicate to Madison Audubon each year, in particular for this work, as well as all the other ways you contribute to our mission! Interested in volunteering with Madison Audubon? Fill out our interest form here. Brand Smith is in that class of volunteers that is so involved, so integrated, that they are woven into the fabric of an organization. His presence makes the whole picture more vibrant and stronger, and his absence would make a clear and notable difference. Brand has been involved with Madison Audubon in a variety of ways for nearly 30 years (!!) and has done it all: seed collecting, prairie planting, bird counts, board leadership (Brand even served as MAS board president in 2009), and more. These days, his focus is running Madison Audubon's kestrel nest box monitoring program -- arguably one of the COOLEST citizen science programs out there. In 2009 Brand, with help from friends and staff at Goose Pond Sanctuary, began constructing, installing, and monitoring nest boxes, starting with 33 boxes. These days, kestrels rely almost exclusively on man-made nest boxes to reproduce and survive. Monitoring involved frequent visits to determine if the nests were active, if the nesting kestrels laid eggs, if those eggs hatched, and if those hatchlings fledged. Because of the success of Brand's program, we now have 153 nest boxes installed in seven counties, visited by over 20 volunteers -- all of which is coordinated by Brand, a volunteer himself! "The reason I like to volunteer for MAS is because it is something totally different from what I normally do, and I feel it makes a difference," says Brand. "Whether I am collecting or spreading prairie seed, counting ducks, or being involved with more detailed outdoor activities I feel like I am helping make a difference in the natural world." And make a difference he does! Incredibly, last year, Brand's band of volunteers documented a record number of 190 kestrels fledge from 47 boxes! In addition to monitoring kestrels, Brand also coordinates a banding effort in partnership with the Central Wisconsin Kestrel Research program since 2016. This has resulted in 250 adult and chick kestrels receiving fancy leg bracelets that allows scientists to begin to understand kestrel nesting ecology, migration, territories, and more. Brand is also a "keystone" volunteer with the atlas project. He is the lead on 3 of our priority blocks (27 square miles) in Atlas II. Just in June 2018, he atlased the Rio and Columbus blocks, canoed the Baraboo Waterfowl Production area by himself for 4 hours (and found 16 common gallinules, including 2 broods and 6 least bitterns including 3 nests a species had to find), and surveyed at Lost Lake State Natural Area - a difficult area to walk through - looking for winter wrens. Still on his list is to canoe a large wetland for confirming yellow-headed black birds, marsh wrens, least bitterns and common gallinules, survey a private land owner's 330 acres in the Poynette NW block, and go on two atlas canoe trips down the Baraboo and Wisconsin Rivers. He frequently takes out other volunteers to help him. 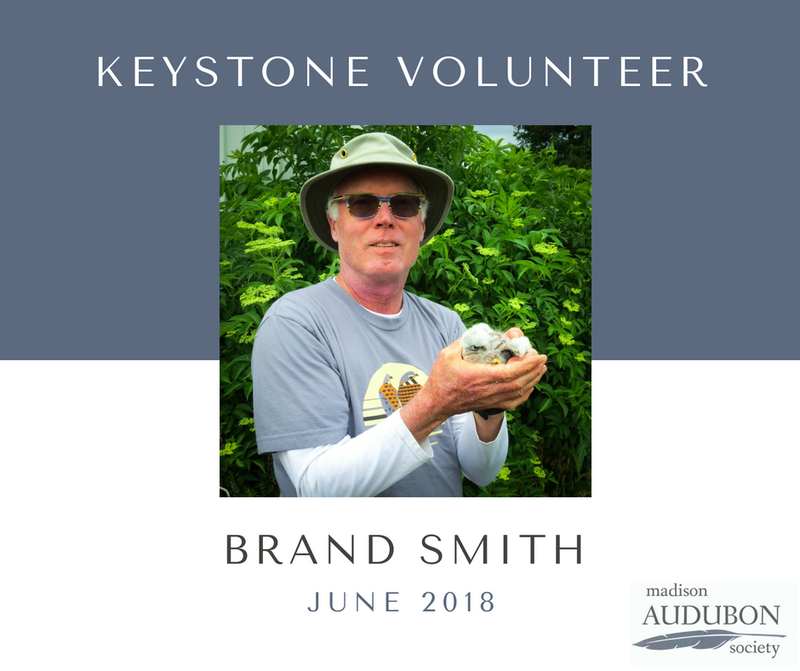 Brand has also volunteered hundreds of hours at Goose Pond Sanctuary over the past twenty years on the Poynette Christmas Bird Count an on the Wood Duck Project. Brand has left his own brand on Madison Audubon, and we -- and all the birds in south-central Wisconsin -- are grateful for it. To learn how you can volunteer with Madison Audubon, visit our volunteer page. Our keystone volunteers are an essential element to the work we do at Madison Audubon.